نجفی, مژگان, عالمی پور, زهرا, رجبی, فاطمه. (1396). ساخت نانوسیمهای آلیاژی آهن-منگنز و بررسی اثر محتوای منگنز، تابکاری و فرکانس الکتروانباشت بر خواص مغناطیسی آنها. علوم و فناوری کامپوزیت, 4(3), 255-262. مژگان نجفی; زهرا عالمی پور; فاطمه رجبی. "ساخت نانوسیمهای آلیاژی آهن-منگنز و بررسی اثر محتوای منگنز، تابکاری و فرکانس الکتروانباشت بر خواص مغناطیسی آنها". علوم و فناوری کامپوزیت, 4, 3, 1396, 255-262. نجفی, مژگان, عالمی پور, زهرا, رجبی, فاطمه. (1396). 'ساخت نانوسیمهای آلیاژی آهن-منگنز و بررسی اثر محتوای منگنز، تابکاری و فرکانس الکتروانباشت بر خواص مغناطیسی آنها', علوم و فناوری کامپوزیت, 4(3), pp. 255-262. نجفی, مژگان, عالمی پور, زهرا, رجبی, فاطمه. ساخت نانوسیمهای آلیاژی آهن-منگنز و بررسی اثر محتوای منگنز، تابکاری و فرکانس الکتروانباشت بر خواص مغناطیسی آنها. علوم و فناوری کامپوزیت, 1396; 4(3): 255-262. آرایه های نانوسیمی Fe100−x Mn x (0 ≤ x ≤ 87) با استفاده از الکتروانباشت همزمان Fe و Mn در حفرات قالب اکسید آلومینیوم آندی (AAO) ساخته شده در آزمایشگاه سنتز شدند. تاثیر ترکیب درصد فلزات انباشت شده، دمای تابکاری و فرکانس الکتروانباشت بر ساختار بلوری و خواص مغناطیسی نانوسیم‌های سنتز شده مورد بررسی قرار گرفت. تغییرات مغناطش اشباع، وادارندگی (Hc) و نسبت مربعی (Mr/Ms) و تغییر ساختار بلوری با تغییر پارامترهای فوق مطالعه گردید. نتایج تصاویر SEM وطیف XRD ساختار bbc نانوسیم‌ها را مشخص نموده و نشان می‌دهد که فاز بلوری با تغییر دمای تابکاری تغییر می‌نماید. نانوسیم‌های تشکیل شده دارای ناهمسانگردی مغناطیسی تک محوره با جهت مغناطیسی آسان در امتداد محور نانوسیم می‌باشند که ناشی از ناهمسانگردی شکلی بزرگ است. همچنین، وادارندگی نانوسیم‌های Fe100−x Mn x با افزایش دمای تابکاری برای همه ترکیبات افزایش می‌یابد. از سوی دیگر، نانوسیم‌های الکتروانباشت شده در فرکانس های مختلف رفتار مغناطیسی متفاوتی را نشان می‌دهند زیرا با افزایش فرکانس الکتروانباشت سرعت احیا یونهای فلزی در قالب کاهش می‌یابد. Ordered Fe100−x Mn x (0 ≤ x ≤ 87) nanowire arrays have been prepared by co-electrodeposition of Fe and Mn into pores of homemade anodized aluminum oxide (AAO). The influence of composition, annealing temperature, and frequency on structure and magnetic properties of Fe/Mn nanowires was studied. The changes in the saturation magnetization, coercivity (Hc), remanent squareness (Mr/Ms), and crystal structure of nanowires with changing of the above parameters were also investigated. The results of XRD and SEM suggest that the nanowires have a bcc structure and that their phases change with the annealing temperature. The nanowires have uniaxial magnetic anisotropy with easy magnetization direction along the nanowire axis due to the large shape anisotropy. Also, the coercivity of the Fe100−xMn x nanowires was increased with increasing annealing temperature for all the compositions. On the other hand, the nanowire arrays electrodeposited at different electrodeposition frequencies show remarkably different magnetic behaviors, due to increasing of the electrodeposition frequency, the rate of ions for reduction was decreased. Tonucci, R.J. Justus, B.L. Campillo, A.J. and Ford, C.E., “Ngnochannel Array Glass,” Science, Vol. 258, pp 783-785, 1992. White, R.M. Newt, R.M.H. and Pease, R.F.W., “Patterned Media: A Viable Route to 50 Gbit/In2 and Up for Magnetic Recording?,” IEEE Transactions on Magnetics, Vol. 33, No. 1, pp. 990-995, 1996. Martin, C.R., “Nanomaterials: A Membrane-Based Synthetic Approach,” Science, Vol. 266, pp. 1961-1966, 1994. Martin, C.R., “Membrane-Based Synthesis of Nanomaterials,” Chemistry of Materials, Vol. 8, pp. 1739-1746, 1996. Whitney, T.M. Searson, P.C. Jiang, J.S. and Chien, C.L., “Fabrication and Magnetic Properties of Arrays of Metallic Nanowires,” Science, Vol. 261, pp. 1316-1319, 1993. Konish, Y. Motoyama, M. Matsushima, H. Fukunaka, Y. Ishii, R. and Ito, Y., “Electrodeposition of Cu Nanowire Arrays With a Template,” Journal of Electroanalytical Chemistry, Vol. 559, pp. 149-153, 2003. Sun, X.Y. Xu, F.Q. Li, Z.M. and Zhang, W.H., “Cyclic Voltammetry for the Fabrication of High Dense Silver Nanowire Arrays With the Assistance of AAO Template,” Materials Chemistry and Physics, Vol. 90, No. 1, pp. 69-72, 2005. Rabin, O. Herz, P.R. Lin, Y.M. Akinwande, A.I. Cronin, S.B. and Dresselhaus, M.S., “Formation of Thick Porous Anodic Alumina Films And Nanowire Arrays On Silicon Wafers and Glass,” Advanced Functional Materials, Vol. 13, No.8, pp. 631-638, 2003. Li, Y. Huang, Y. Yan, L. Qi, S. Miao, L. Wang, Y. and Wang, Q., “Synthesis And Magnetic Properties of Ordered Barium Ferrite Nanowire Arrays in AAO Template,” Applied Surface Science, Vol. 257, No. 21, pp. 8974-8980, 2011. Huang, C. Wang, P. Guan, W. Yang, S. Gao, L. Wang, L. Song, X. and Murakami, R.,“Improved Microstructure and Magnetic Properties of Iron–Cobalt Nanowire via an Ac Electrodeposition With A Multistep Voltage,” Materials Letters, Vol. 64, No. 22, pp. 2465-2467, 2010. Yang, Z.H. Li, Z.W. and Kong, L.B., “One-Step Synthesis of Ni0.23Cu0.11Zn0.66Fe2O4 Ferrite Nanowire Arrays Using A Template Method,” Journal of Alloys and Compounds, Vol. 501, No. 1, pp. 173-176, 2010. Choi, J. Kim, S.J. Lee, J. Lim, J.H. Lee, S.C. and Kim, K.J., “Controlled Self-Assembly of Nanoporous Alumina for the Self-Templating Synthesis of Polyaniline Nanowires,” Electrochemistry Communications, Vol. 9, No. 5, pp. 971-975, 2007. Yang, S.G. Zhu, H. Yu, D.L. Jin, Z.Q. Tang, S.L. and Du, Y.W., “Preparation and Magnetic Property of Fe Nanowire Array,” Journal of Magnetism and Magnetic Materials, Vol. 222, No. 1-2, pp. 97-100, 2000. Zhang, X.Y. Wen, G.H. Chan, Y.F. Zheng, R.K. Zhang, X.X. and Wang, N., “Fabrication and Magnetic Properties of Ultrathin Fe Nanowire Arrays,” Applied Physics Letters, Vol. 83, No. 16, pp. 3341-3343, 2003. Bao, J. Xu, Z. Hong, J. Ma, X. and Lu, Z., “Fabrication of Cobalt Nanostructures with Different Shapes in Alumina Template,” Scripta Materialia, Vol. 50, No. 1, pp. 19-23, 2004. Rahman, I.Z., Boboc, A. Razeeb, K.M. and Rahman, M.A., “Analysis of Magnetic Interaction in Ni Nanowire Array Grown Using Electrodeposition Process,” Journal of Magnetism and Magnetic Materials, Vol. 290-291, pp. 246–249, 2005. Ramazani, A. Almasi Kashi, M. Kabiri, S. and Zanguri, M., “The Influence of Asymmetric Electrodeposition Voltage on the Microstructure and Magnetic Properties of FexCo1-x Nanowire Arrays,” Journal of Crystal Growth, Vol. 327, pp. 78–83, 2011. Rousse, C. and Fricoteaux, P., “Electrodeposition of Thin Films and Nanowires Ni–Fe Alloys, Study of Their Magnetic Susceptibility,” Journal of Materials Science, Vol. 46, pp. 6046-6053, 2011. Zhu, H. Yang, S. Ni, G. Yu, D. and Du, Y., “Fabrication and Magnetic Properties of Co67Ni33 Alloy Nanowire Array,” Scripta Materialia, Vol. 44, pp. 2291–2295, 2001. Cho, J.U. Wu, J.H. Min, J.H. Lee, J.H. Liu, H.L. and Kim, Y.K., “Effect of Field Deposition and Pore Size on Co/Cu Barcode Nanowires by Electrodeposition,” Journal of Magnetism and Magnetic Materials, Vol. 310, No. 2, pp. 2420-2422, 2007. Maleki, K. Sanjabi, S. and Alemipour, Z., “AC Electrodeposition of Nimn Alloy Nanowires in AAO Template,” International Journal of Modern Physics B, Vol. 29, No. 31, pp. 1550224(1)-1550224(13), 2015. Gelves, G.A. Murakami, Z.T.M. Krantz, M.J. and Haber, J.A., “Multigram Synthesis of Copper Nanowires Using Ac Electrodeposition Into Porous Aluminium Oxide Templates,” Journal of Materials Chemistry, Vol. 16, No. 30, pp. 3075-3083, 2006. 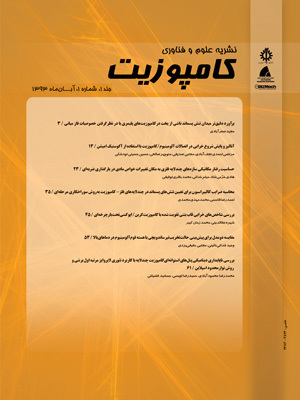 Najafi, M. Soltanian, S. Danyali, H. Hallaj, R. Salimi, A. Elahi, S.M. and Servati, P., “Preparation of Cobalt Nanowires in Porous Aluminum Oxide: Study of the Effect of Barrier Layer,” Journal of Materials Research, Vol. 27, No. 18, pp. 2382-2390, 2012. Wang, Y.W. Zhang, L.D. Meng, G.W. Peng, X.S. Jin, Y.X. and Zhang, J., “Fabrication of Ordered Ferromagnetic-Nonmagnetic Alloy Nanowire Arrays and Their Magnetic Property Dependence On Annealing Temperature,” The Journal of Physical Chemistry B, Vol. 106, pp. 2502-2507, 2002. Wang, Y.W. Zhang, L.D. Meng, G.W. Peng, X.S. Jin, Y.X. and Zhang, J., “Magnetic Properties of Ordered FexAg1−x Nanowire Arrays Embedded In Anodic Alumina Membranes,” Chemical Physics Letter, Vol. 339, No. 3-4, pp. 174-178, 2001. Wang, Y.W. Wang, G.Z. Wang, S.X. Gao, T. Sang, H. and Zhang, L.D., “Fabrication and Magnetic Properties of Highly Ordered Co16Ag84 Alloy Nanowire Array,” Applied Physics A, Vol. 74, No. 4, pp. 577-580, 2002. Najafi, M. Assari, P. Rafati, A.A. and Hamevaisy, M., “Effect of the Electrodeposition Frequency, Wave Form, and Thermal Annealing on Magnetic Properties of [Co0.975Cr0.025]0.99Cu0.01 Nanowire Arrays,” Journal of Superconductivity and Novel Magnetism, Vol. 27, No. 12, pp. 2821-2827, 2014. Najafi, M. Rafati, A.A. Khorshidi Fart, M. and Zare, A., “Effect of the pH and Electrodeposition Frequency on Magnetic Properties of Binary Co1−xSnx Nanowire Arrays,” Journal of Materials Research, Vol. 29, No. 2, pp. 190-196, 2014. Najafi, M. Alemipour, Z. Hasanzadeh, I. Aftabi, A. and Soltanian, S., “Influence of Annealing Temperature, Electrolyte Concentration and Electrodeposition Conditions on Magnetic Properties of Electrodeposited Co-Cr Alloy Nanowires,” Journal of Superconductivity and Novel Magnetism, Vol. 28, No. 1, pp. 95-101, 2015. Najafi, M., “Influence of Composition, pH, Annealing Temperature, Wave Form, and Frequency on Structure and Magnetic Properties of Binary Co1−xAlx and Ternary (Co0.97Al0.03)1−xFex Nanowire Alloys,” Journal of Superconductivity and Novel Magnetism, Vol. 29, No. 9, pp. 2461-2471, 2016.